Disposing of non-nutrient agricultural waste needs to be a year-round effort. Burning and burying non-nutrient agricultural waste can pollute the air, contaminate water and can have other potential harmful impacts on the environment, which can harm people and livestock. Consider recycling or reusing your waste instead – recycling and reuse not only lowers your dump costs, it can also help you keep your property waste-free, and protects your soil and local drinking water supplies. Not sure where to start? See CleanFARMS’ Guide to Recycling Non-Nutrient Agricultural Waste in Ontario for ways to reduce the amount of agricultural waste going to landfill. Many municipalities in Ontario have agricultural waste recycling programs, such as Kincardine’s Agricultural Film Recycling Program. Contact your municipality to see how you can reduce the amount of waste going to landfill. You can prevent containers, machinery fluids, electronics, hazardous materials and other non-nutrient agricultural wastes from ending up in landfills. Check out the CleanFARMS recycling programs and collection sites across the province. Visit the Ministry of the Environment and Climate Change’s website to learn more about Ontario’s plan for waste reduction and the new Waste-Free Ontario Act, and other waste-diversion programs in the province. Contact the ministry at 1-800-565-4923 or submit a message on their website. Add the disposal of farm wastes into your Environmental Farm Plan. The Ministry of Agriculture, Food and Rural Affairs (OMAFRA) has two factsheets, “Recycling Farm Plastic Films” and “Responsible Disposal of Unwanted Medicines and Sharps,” that can help you with safe non-nutrient waste disposal. Visit the OMAFRA website for more information. Maintaining Strict Biosecurity is Essential to Keeping Your Herd Healthy! Cooler temperatures are on the way, and it is important to review your biosecurity practices and procedures on farm. Whether it is PED or other pathogens, ensuring strict on-farm biosecurity protocols will help you prevent infection and keep your pigs healthy. Proper biosecurity measures should include protocols that address animal, supply and personnel movements. Take the time to review the policies and procedures with staff, highlighting the importance of biosecurity for your herd. Set up Controlled and Restricted Access zones on your property, and make sure they are well signed to prevent non-authorized entry. When it comes to farm access, all vehicles should be clean and free from manure. If a vehicle has been at another farm site, make sure it is washed properly before arriving. This is especially true for trucks and trailers. Ensure clothing and footwear coming on site is clean and has not been on other farms, and make use of a visitor log book to track who has been on your property and when. At a minimum, set up and use a Danish Entry or other comparable system with a hand wash station for any personnel movement in and out of the barn. Designated boots and clothing should be available and used. Where possible, make use of a shower in/shower out system. Do not wear barn clothing or boots outside. When bringing in supplies and equipment take appropriate precautions such as disinfection and removal from shipping boxes where appropriate. Ensure you have an effective rodent and pest control program in place, and use screens for bird control. Do not allow pets in barns as they can also be a vector for disease transfer. Although the cold and snow are fast approaching, don’t let your biosecurity guard down. Be vigilant and keep your herd protected and healthy! Detailed information on biosecurity practices and procedures can be found on the OMAFRA livestock website at http://www.omafra.gov.on.ca/english/livestock/swine/health.html. 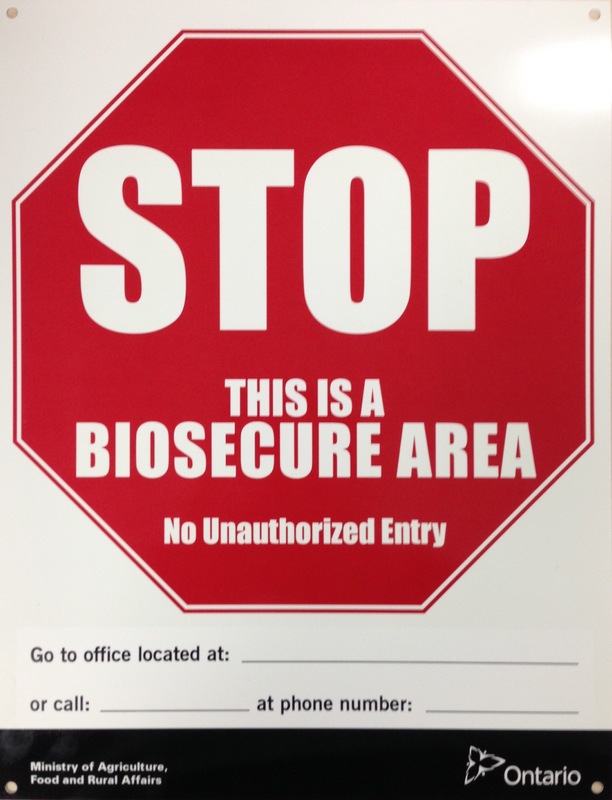 Biosecurity ‘STOP’ signs and visitor log books can be ordered by contacting the Agricultural Information Contact Centre at 1-877-424-1300 or ag.info.omafra@ontario.ca. Established in 2014, the Food Donation Tax Credit for Farmers, gives farmers a tax credit valued at 25 per cent of the fair market value of the agricultural products they donate. Community food programs, like the student nutrition program, also benefit by receiving more fresh local food for distribution to Ontario families. This credit helps to ensure that more locally grown food ends up on people’s plates, and that includes the people who need it most in our communities. have donated agricultural products to an eligible community food program in Ontario. If you are a farmer, reach out to your local community organizations and see how you can work together to bring more fresh, local food to people in need.